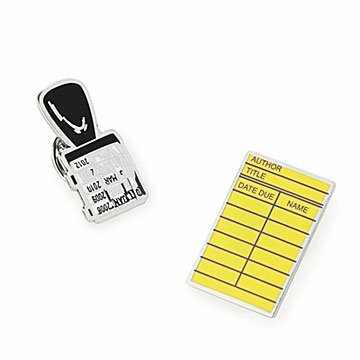 This library card and date stamp pin duo will be sacred totems for book lovers. Know someone whose happiest moments and most life-changing experiences happened while their nose was in a book? (Maybe it's you.) For hard-core bibliophiles, this library card and date stamp pin duo will be more than just charming reminders of old-school, pre-digital libraries— we're talking sacred relics. Plus, now that people tend to read on tablets, it's hard to ID a fellow book person: is he/she reading War and Peace or playing Call of Duty? Wear these, and encourage the start of a beautiful friendship. Made in China. Great gift for a book lover or librarian. These pins are great. I was worried they would be too small but they are just right. The craftsmanship is excellent. They really are perfect.